Welcome to the Open Knowledge Festival 2014 website! Welcome to the brand new online home for the Open Knowledge Festival 2014! We hope you’re as excited as we are about this year’s OKFestival, which will be taking place in Berlin from 15th – 17th July. OKFestival 2014 builds on many years of successful international open knowledge events hosted by the Open Knowledge Foundation – including OKFestival 2012 and OKCon 2013 – to create a meeting that’s focused on turning knowledge into positive action. You can now buy earlybird tickets for OKFestival for 120€ per person. This includes the opening event on the 15th and both full days of the festival on the 16th and 17th. There are only a limited number of these tickets, so make sure you don’t miss out! Once the earlybird tickets have gone, regular tickets will be released at 150€ per person. If you’re a student, we’re also offering tickets at a discounted rate of 100€ – you’ll need to show a valid student ID when you collect your name badge at the festival. If you’re attending on behalf of an organisation, then the 350€ business ticket is the right one for you. As well as giving you food and drink vouchers, and a Berlin tour, the ticket is also transferable, meaning that you can let us know if you’re attending on one day of the festival and a colleague will be using the ticket on another day. If you’ve got any questions about buying tickets, take a look at our ticket FAQs. If you’ve still got queries, you can get in touch with us directly: tickets@okfestival.org. Details of how to contribute to the OKFestival programme coming soon! We’ll be sharing more information about the different topic streams that will form the structure of the OKFestival programme soon. We’ll then be asking for session proposals for each of the streams. So if you’ve got ideas about a discussion that you’d like to lead, a hack that you’d like to wrangle, or a group of people that you’d love to bring together to swop knowledge, please start shaping your ideas ready to let us know about them. We’re also keen to see fringe events hosted in Berlin on the days around the Festival. These might be longer hacks, workshops or social events. While we won’t be able to provide a venue for these events, we’d love to hear from you if you’re thinking of putting one together. OKFestival is a great opportunity to bring together an international crowd of open knowledge enthusiasts. To make the event as accessible as possible to all who would like to join us in Berlin, we’re offering financial aid packages to cover admission, travel and accommodation costs for a limited number of attendees. For more information on how to apply, keep an eye out for an announcement about the programme soon. OKFestival is made financially possible thanks to the generous support of sponsors. If you’d like to find out more about the opportunities to contribute to the event, please get in touch with us at: sponsorship@okfestival.org. It was just last week that we invited the open communities to start collaborating and warming up for the upcoming Open Knowledge Festival. Today we can already share with you the learnings and outcomes of the first OKFestival Meetup (in Berlin) – as we would love to imagine it, this was just the first in a long, diverse and busy series (no pressure, it’s all up to you!). Folks from the Open Knowledge Foundation, Code for All, Free Software Foundation Europe, Open Bank Project, AfricaHackTrip, Hacks/Hackers, and Open Product Data facilitated a great evening of skill-sharing, peer-to-peer learning and exciting findings from each other’s projects. We spread the word about open (what is open? What does open knowledge mean? How many things around us can be open? ), dug into a multitude of open projects and started discussing and writing down first ideas to be proposed for the festival (we’ll call for the community’s proposals to shape the agenda very soon – sign up for the festival’s newsletter to be the first to know when). But which are exactly the ingredients that made the evening special? We listed them and thought about sharing with you all – and you’re welcome to have a go too. * Diversity – the speakers came from different open communities (and countries, and languages) and we also invited people who wanted to discover more about open to join. Both newcomers and experienced folks in the open fields found a lot to learn from each other. The open ecosystem spreads itself in all directions, from open source, to open culture, government, science, education, environment and even to products we buy at the supermarket. There is so much to learn, talk about and share – and our peers can be the best source of new exciting discoveries. This doesn’t mean that multiple topics are always recommended, but inviting people with different backgrounds can often be a plus. * Participatory format – we all love listening to a thrilling lecture, but sometimes attending a talk with just a short Q&A at the end just doesn’t satisfy our curiosity to know more about new topics and people. 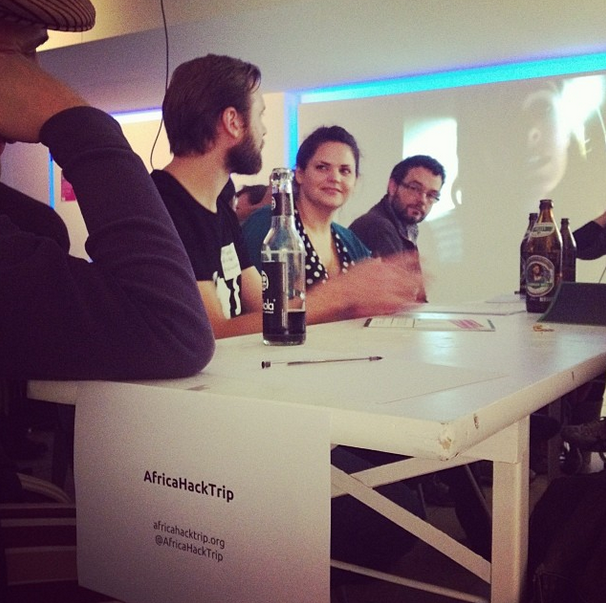 So we experimented and organized the Berlin evening as a speed geeking session. What is it? Each project (and project’s presenter) has a table with chairs around. Participants are divided into groups, and each group starts sitting at one table, and talks with the presenter for 5 minutes. After that, at the sound of a gong (a kitchen pan, in our case) it’s time for each group to move to the next table and project. And if 5 minutes were not enough, there’s time (and rehydrating drinks) immediately after. It was a lot of fun – we’ll add the format to the Events Handbook soon. So, what are you waiting for? Wherever you are, whatever is the field of open you’re passionate about, however you want to meet (be it in an embassy, in your kitchen, or in a bar!) – run your OKFestival Meetup! And don’t forget to share all about it on the dedicated etherpad; we can’t wait to hear what open means to you, feature your greatest meetups, and make OKFestival happen with you! 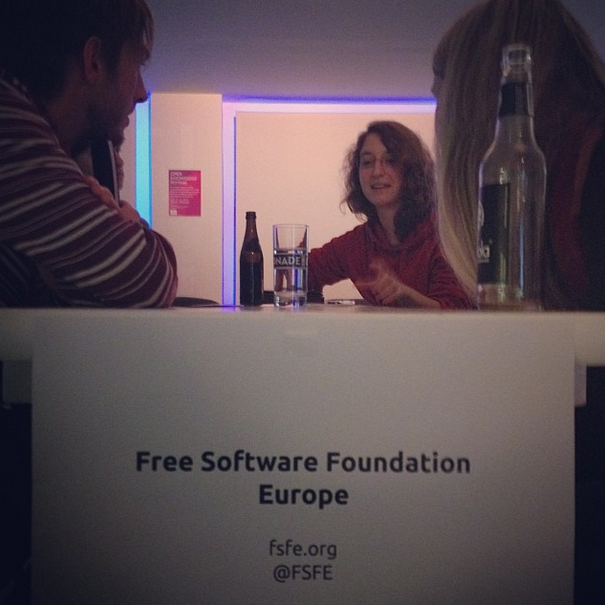 Open Knowledge Festival Meetups all around the world – now! We’re getting closer to the Open Knowledge Festival (Berlin, 15-18 July 2014 – save the date!) and it’s time to roll up our sleeves! OKFestival (as friends call it) will gather people from all the open movements, communities and projects of the world. Planning and making stuff together will be awesome. So why should we wait until July? * spread the word about open and the festival with anyone who’s not (yet) familiar with them – be the spokeperson of open! The Open Knowledge Festival aims to give all its participants the opportunity to show/ share/ discuss/ make: that’s why it’s time to get ready to impress! And more than this: how to share ideas across pre-OKFestival Meetups? * Mixing up online and offline. If you have an offline meetup (from 5 to 500 people! ), invite folks to join online from other countries (a Berlin meetup will experiment with this this week). If you have an online event, if the connection permits say hi face to face via hangout or exchange dates of the upcoming conferences you’ll attend and get the chance to meet some of your online peers. 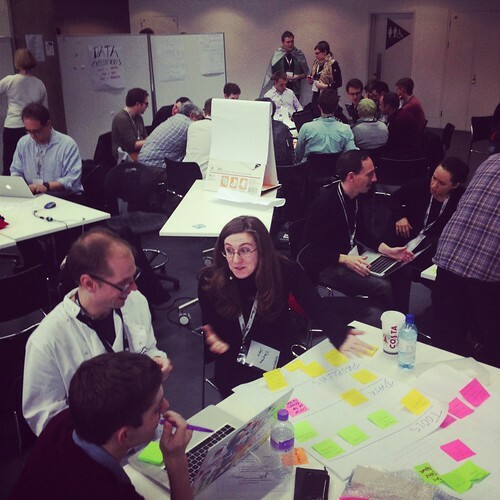 Get meeting, sharing and making!